A light, spring time dessert. Place 4 sheets of filo pastry on top of each other and cut into 6 squares. Brush each square with melted butter, place them in buttered moulds. Place the moulds on a baking tray and cook in the oven preheated to gas mark 6 (180°C) for 4 minutes until the pastry is golden-brown. Take out of the oven, leave to cool and then carefully remove from the mould. 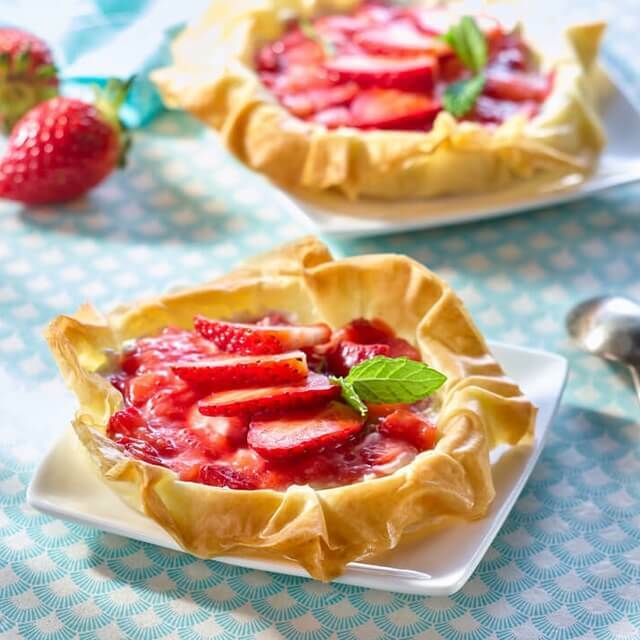 Cut the strawberries into small pieces heat them in a saucepan with the butter and 2 tablespoons of sugar. Mix the mascarpone with the vanilla seeds, the icing sugar and milk. Mix gently with the strawberries. Sprinkle the bottom of the crowns with ground almonds. 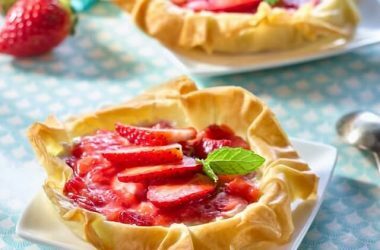 Pour the cream mixture and the strawberries into the crowns, decorate with diced strawberries and mint leaves.